Speedy Go App Review: Speed Boost for Symbian S60 Mobile Phones? Mobile phones were invented so that people could communicate easily through long distances but as time has advanced these phones have turned into powerful and convenient devices allowing you to perform a number of daily tasks. Cellphones have also become fashion statements and today we witness a never-ending competition to own the latest and fastest device and a ceaseless desire to achieve faster speeds and maximum performance. This is where Speedy Go comes into the picture. With Speedy Go, you can accomplish faster speeds on your Symbian S60 mobile phones resulting in maximized performance. This can be done by achieving display acceleration and an overall speed boost. The developer claims to provide about a 10 to 70 percent speed boost that can be easily checked and compared with normal phone speed by using its inbuilt speed testing feature. The app can also be used to compare the speed and performance of different Symbian mobile phones. Speedy Go is compatible with almost all Symbian S60 phones including the latest touch-screen models. 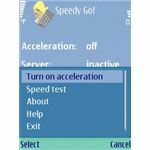 Speedy Go is developed by CellPhoneSoft and the trial version can be downloaded from their website by clicking here. After you have downloaded the setup file, you can easily install the application on your phone by connecting your device to a desktop PC and using Nokia PC Suite to run this setup file. After I had installed the application on my device, I opened it from my phone menu which guided me to its main settings screen. The main screen displays the current status of phone acceleration along with speed and memory values. Here I could enable or disable the display acceleration by clicking on the ‘Acceleration’ tab. The ‘Server’ tab displays status of accelerator server module and ‘Memory’ tab displays amount of memory utilized by application’s acceleration module while boosting phone performance. The ‘Phone Speed’ tab indicates the overall normal speed index of the phone before applying acceleration. The ‘Speedy Speed’ tab indicates the boosted speed index of the phone after applying display acceleration and a higher value means stronger acceleration leading to better performance. After conducting several speed tests on my Nokia E71, I noticed that my phone speed increased from 353 to 371 which was hardly a noticeable change. Then I borrowed a Nokia N85 from a friend of mine and used Speedy Go to apply display acceleration on this device. The results were almost identical and I also noticed a slight drop in network reception, call and audio/video quality. However, other apps seemed to open a bit faster and I must admit that I felt a boosted performance, but it was for a short time period. The application didn't work as expected on any of the phones I used for testing. On the other hand, the developer claims that this application provides a 10 to 70 percent speed boost to normal phone speed and this might probably be true for some of the models. But my tests showed no positive results to support developer’s claims. Hence I advise my readers to download and test the trial version on their phones before buying the final product. This will enable you to see for yourself if this application is compatible with your device and if it is worth spending your hard earned money.